Last revised May 11th, 2015. Welcome to the Porsche Club of America's Cayman Register. This web portal has been created to bring Cayman fans together, to enhance their Porsche ownership and PCA membership experience. The internet and web forum platform allows us to meet, discuss and spend time together no matter where we live. But this venue is not without its challenges. In an attempt to prevent those challenges from damaging the experience intended, we've put together some rules to help you understand what's expected of you, what's allowed and what's not. This document is presented to define the standards and ethics to which the organization holds itself, its elected and appointed representatives, its employees, and its members. It supplements but does not replace our established Bylaws and procedures, which are documented elsewhere. The following represents the way we want to be and to do business. Members of the Cayman Register are expected to subscribe to and act within the PCA Code of Ethics when participating at the Cayman Register or at any Cayman Register event. Remember that web forums are just like public gatherings. Every member can read what you've written. The ability to speak or write in public comes with certain responsibilities. First and foremost we ask that you be respectful of your fellow members. We all have the right to our opinions, and those expressed may not support yours. Insulting or attacking a member in public because you don't agree, usually referred to as “Flaming”, will not be tolerated here. When posting, please use language that is neither demeaning, embarrassing, derogatory, or otherwise inappropriate. Discussion of sexual, political or religious topics is prohibited at the Cayman Register. These topics almost always invite strong opinions and disagreements. Please remember, this is a forum for automotive enthusiasts to discuss the Porsche Cayman. Please respect all Copyright laws. Posting protected articles or copyrighted pictures can place you and this website in serious legal peril. It's OK to post a link to an existing article, or a small excerpt with a link, but please do not copy and paste copyrighted articles. If you have questions or want guidance about this, please contact our website management. In Web forums we sometimes see members sign up with the sole intention of causing trouble. These forum members are called “Trolls”. Trolls will often post inflammatory statements just because they like to see the trouble that follows. Trolling is prohibited. If you see a post that you think is troll-like, please resist the temptation to ‘feed the troll'. If our website management determines that you are trolling, your privileges at the Cayman Register will be temporarily or permanently suspended. Members may have one, and only one identity in this community. Signing up with alternate user names is not allowed. There is no good reason to have more than one identity here. If you're having trouble accessing your user credentials, please contact any of our website management and we'll be happy to help you gain access to your account. If you chose to alter your user title, please be sure that your new title is accurate and not misleading. Intentionally misrepresenting yourself here may result in temporary or permanent expulsion from the Cayman Register. If you do not find a forum for a subject you are thinking of posting about it is likely because we intentionally did not not provide one. You will notice that we do not have an “Off Topic” forum for example. The Cayman Register is intended to be a place where member discussions pertain to PCA, Caymans and Porsches. This site is not a marketing venue. Our members come here to discuss their cars. It's understandable that many of those discussions may discuss a certain product or service. If you are going to give a testimonial on something, that testimonial should be based on firsthand experience and it must be objective and accurate. Promoting products or services in which you stand to benefit from in any way is considered solicitation and will not be allowed. Some members of this community may represent companies that offer automotive products or services. But as members of this community they are expected to represent themselves as PCA members. If you have questions or comments on their products or services we would very much appreciate that you respect our ad-free environment and contact these members directly and not use the forums of the PCA Cayman Register to do so. "For Sale", "For Trade", "Wanted" or "Want to Buy" ads or posts are not allowed in the forums at any time. If you have a car or parts for sale, please use the PCA Mart on PCA.org to advertise your car or other items. The Mart has national reach - your ad will get much more visibility there, and posting ads is free for all PCA members. To help facilitate members' ads in the PCA Mart. You may post a notification of your ad in the Mart in the PCA Mart Classified Ads forum. There, you will find a simple form to fill out that will generate a notice in that forum directing members to the items you have advertised in the PCA Mart. "For Sale" ads posted in any other forums will be deleted immediately, and the original poster will be notified of its deletion. This is a community made up of volunteer automotive enthusiasts. Our website moderators are unpaid volunteers - volunteers who dedicate a lot of time to preserving the quality of the community. Though we try, we cannot read every post in real time. There will be times when members like yourself will come across posts that may require moderation before we find them. You can help the community by bringing these posts to our attention. To do this, simply click the 'Report Posts' button found in the upper right area of the post header (it looks like this ). Provide a brief description of why you believe we should review the post. All of our moderators will receive a notice calling the reported post to our attention. We welcome and encourage you to use this tool whenever you see a questionable post. We will enforce the PCA Code of Ethics and Cayman Register rules. Violation of this code or rules may result in temporary or permanent suspension of your posting privileges here. While we don't like to edit or delete any information posted here, we reserve the right to do so if we feel that posted information disrupts the community or damages the membership experience. Information copyrighted or owned by any individual or entity other than the member should not be posted on the discussion forums or our libraries without the consent of the owner. If such an event occurs, the individual posting the information shall be held solely responsible. The Cayman Register Team and site shall not be held responsible for member-posted information that may violate copyright law. Material deemed to be copyrighted and posted without proper clearance will be removed by the moderation team. All contents, graphics, look and feel, and trade dress of the Cayman Register Web Site are owned by the Porsche Club of America. All rights reserved. In addition, posts, graphics, and pictures posted and/or uploaded by individual members, are also the sole copyrighted property and opinions of the individual posters, and do not necessarily reflect the opinions of the Porsche Club of America, it's directors, officers, and members, or the administrators and/or moderators of the Cayman Register Web Site. Do not republish information found at the Cayman Register. Duplication of copyrighted materials published here without written permission from the original copyright holder may result in temporary or permanent expulsion from the Cayman Register. PCA, the Cayman Register site and its management will not be responsible for for any direct, consequential, or other damages resulting from information or misinformation posted to The Cayman Register. Moderators do not check articles for accuracy, nor do they guarantee or warrant the information provided on the forum for any specific purpose or use. No warranties, expressed or implied, are made. There has been a lot of talk lately on the Web and in the media about privacy. The Porsche Club of America and the Cayman Register take your privacy very seriously so we'd like to document and communicate how we handle privacy. The Cayman Register is a little different than most online Web forums. The Cayman Register is a closed and private online community. What happens here, stays here. Here are some details about what is and what is not available for public consumption. All other discussion forums at the Cayman Register are Private, meaning they are only visible to logged in Cayman Register members. Membership in the Cayman Register is limited to current and verified PCA members only. Anyone who is not a PCA member cannot be a member of the Cayman Register. So, anything you share here in our private forums, you are sharing only among your fellow PCA members. What you write in the public forums is visible to non-registered visitors to the site. Visitors and unregistered guests cannot post to any forums. The Date and Time Stamps on public posts are not visible to unregistered guests. Any and all pictures hosted at the Cayman Register are private and displayed only to logged in members. Visiting guests cannot see them. The only exception is our 'Picture of the Month' column, which is visible to unregistered guests. Please keep this in mind when submitting photos for this column. We allow you to delete any of your pictures at any time for any reason. They are your pictures. We respect your copyright and understand that your submission of pictures is revocable at any time. Any uploaded files are only accessible by registered members. Guests cannot download anything from our files section. Our Member List is only visible to registered members, not to visiting guests, and even registered members can see very little information about you. They can see your user name, home state, PCA region and zone, and any information you decide to share about your car with the exception of your VIN, that's private (more on this below). As you can see, we take your privacy very seriously. We hope that a better understanding of our commitment to privacy will provide you with comfort and confidence. If you have any questions about any of these policies, please feel free to write to any of our Administrators. Thank you for your trust and remember that when you share information with your fellow members, we've got your back. During registration we ask our members to provide a lot of detail about themselves. That can be a little daunting in this day and age of digital information theft. Before you provide us with any information, I think it's very important that you know how it is used, what is private and what is public. Here's a list of what we will ask you for, how we will use it and how we will or will not share it. First & Last Name Required Private Used to verify PCA membership. Date of Birth Required Private* Used for age verification. See below for more info. Street Address Required Private Used to mail welcome letter, Cayman Register Window Decal and any promotion, drawing or giveaway winnings. E-Mail Address Required Private Primary communication method between CR and you. Phone Number Optional Private Used to create contact lists for events, only if you provide permission for us to share it with fellow attendees. Biography Optional Public These are entirely optional and only used to let other members know more about yourself. PCA Member Number Required Private Used to verify your PCA membership. PCA Zone Required Public Used to notify you of interesting events taking place close to you. Model Year Optional Public Vehicle information is very helpful to us when we are seeking technical answers on your behalf. The Porsche PIWIS Technical Resource allows us to search for answer for a specific VIN, which can be very helpful in finding the right answer. Public fields are visible to all Cayman Register members and can be used to help find others with like interests. Examples given, imagine you want to attend a local PCA meeting but you'd like some company. As a member you can search the member list for others in your region. Or, perhaps you own a 2008 2.7 Liter Cayman and you are experiencing an unusual shifting problem. You could use the advanced member list search to find others who have registered a 2008 2.7 Liter Cayman so you could contact them to find out if they've ever experienced a similar problem. Private fields are visible only to Cayman Register management. This information is used only for official Cayman Register business and is never shared with any individual, company or entity. You also have the option of limiting a lot of the information that is made public about you. In your Privacy Settings you can alter the privacy of public Contact Info, Profile Pictures, Photo Albums, About Me, Friend Lists or Recent Profile Visitors. You may make this information available to Everyone (not recommended), Registered Members (default), Your Contacts or Friends. Another common concern today is spam. Every time I provide my e-mail address to any website I wonder if I just opened the gates to spam hell. Rest assured, we never share your e-mail address with any person, company or entity. We do from time to time send out notices of what's happening in your area, or updates about the Cayman Register. In your User Options you can control how your e-mail address is used. You have the option to block administrative e-mails, you can allow members to e-mail you, and you can choose if you'd like to receive e-mail alerts for Private Messages and Friendship Requests. If you chose to allow members to e-mail you, that doesn't mean we'll let them see your e-mail address. Instead we present them with a messaging window that will allow them to generate an e-mail to you (through our system). Once your receive that e-mail, it's your choice whether or not you want to reply to them. Keep in mind that if you do reply, you will then share your e-mail address with them, so you should only reply to people you trust. As you can see, unlike most internet web forums and social networks, we are very serious about privacy. Remember, when you're at the Cayman Register you're inside a closed PCA resource. We always adhere to the PCA Code of Ethics and Privacy Policies. If you have any further questions or concerns about privacy, please feel free to Contact Us. Q - Why do I have to login to read the Cayman Register forums? Most other forums can be read without logging in. Q - Does Cayman Register membership cost money? No. 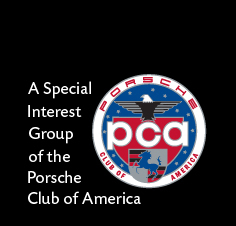 Access to the Cayman Register is a free benefit of membership in the Porsche Club of America (PCA). Membership to the PCA does cost money, but there are many benefits and membership is pretty inexpensive. If you'd like to register or learn more, click here. Q - Do I need to own a Cayman to join the Cayman Register? No. We encourage all PCA members who have any interest in the Cayman to join us. Q - Is the Cayman Register owned and/or controlled by Porsche? No. 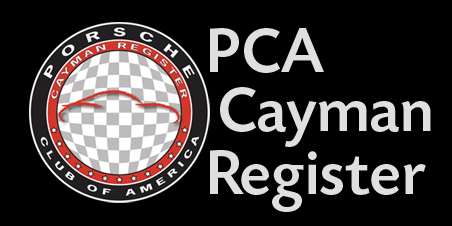 The Cayman Register is part of the Porsche Club of America (PCA). The PCA is 100% independent, as is the Cayman Register. Porsche does recognize and support the PCA in many ways. You may see this in the fact that they allow us to use their logos, trademarks, photos and videos. The use of these materials is granted under a licensing agreement between Porsche and the PCA. Porsche also provides access to technical resources, historic data and connections to many departments inside Porsche. Because of this support and relationship you will find an extraordinarily high level of expertise and accuracy in the information shared inside. Q - Will the Username and Password that I use at www.PCA.org work here? No, I'm afraid not. This is a completely different software installation that requires you to sign up here as well if you'd like access. If you'd like to use the same user name here, feel free to enter that name during registration. If the name is available, you will be able to use the same name at both websites. Q - Will my e-mail address be spammed if I join the Cayman Register? No. We never share your e-mail address with anyone. We do however send targeted e-mails from time to time. For example, if there is a cool event taking place, we might send a message to all members in that area to make them aware of it. Or, if there is something exciting happening at the Cayman Register, we might send you a message to call it to your attention. On average, we send about 6 messages a year to our members. We understand if you don't want to receive any e-mails, so we do give all members the option to opt out of all communications. Q - Do you allow vendors to post and/or run group buys inside the Cayman Register? No. The Cayman Register is 100% commercial free. This ensures the highest level of integrity and objectivity. The Cayman Register is like a private club house for Cayman enthusiasts. If a member shares a testimonial, you can be sure that it's honest, unbiased and without hidden agendas. Q - I'm not one of those internet guys that spends time in online forums. Is there any other reason I'd want to join the Cayman Register? Yes. Many members join to be part of our mailing list, so they can be notified if something big is happening in the Cayman world. Throughout the year we may notify members about free giveaways, special events and/or invitations or breaking news. We don't contact our members very often, but when we do it's always valuable information. Q- During registration I was asked for my Cayman's VIN. Do I really need to provide this...? You don't need to, but we strongly encourage you to. Your VIN will remain a private part of your user profile. We often use VINs when a member asks a technical question, because the Porsche Technical resources that we have access to can narrow searches when a VIN is provided. We may also use your VIN to identify and contact you if we discover an issue that might effect your car. Q - I've seen Caymans on the road with Cayman Register window decals on them. How do I get one of those? We send these out members after they register with us. It's our "Thank You" for joining and it helps our members show that they belong to this special group. Please allow 2 weeks for delivery. If you've gotten a new Cayman and need a new decal, please send us a private message and let us know. We'll get a new one out to you in our next mailing. Q - I love what I see here and want to make a donation. How can I do that? That's very flattering. This place has been created by, and is run by passionate volunteers. We are very proud of the Cayman Register and glad that you value it, but we absolutely cannot accept your donations. The PCA is a non-profit club. We do what we do for the love of our hobby and for the collective benefit of our fellow members. If you really want to give back, please do so by contributing an article or valuable reply in our forums. Believe me when I tell you that your appreciation goes a long way. I encourage you to write a "Thank You" post to the Cayman Register team in our Website Feedback forum.